As I cleared away winter’s debris from my garden this morning, I came upon a clump of slim green shoots poking through a pile of dried leaves: chives. A perennial herald of early spring, tender blades of chives show up just as the crocus and snowdrops begin to fade. They are the first plant growing in my garden that we can actually eat, and I enjoy plenty of them while they are tender and young. Chives are easy to grow in my Seattle garden, resembling round stalks of tall green grass. Unlike most culinary herbs, they do not spread throughout the garden, but grow in a small, contained clump, which I very much appreciate. I spent most of my gardening day yanking out runners of mint, pulling up rogue parsley plants, and wrenching masses of unruly lemon balm out of the ground, which made me grumpy and caused me to develop a ganglion cyst on my thumb. The orderly, compact habitus of a single chive plant tucked into a corner of the garden was a welcome sight. 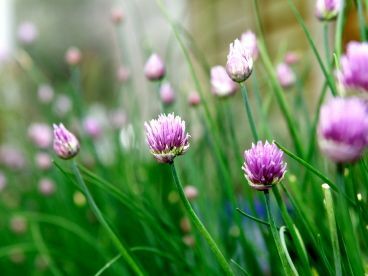 Chives flower in late spring, sending up bulbous shoots that burst open to reveal pink or purple globes of tiny flowers. The flowers are edible and can be steeped in white vinegar and used to make pale purple, mildly onion-flavored vinaigrette. The hollow cylindrical leaves of chives are often snipped with scissors to garnish baked potatoes or vegetable soups. When mixed in stir-fries or used in pasta dishes, chives can be cut in "batons," which are pieces about 1 inch long. At restaurants, a small spray of longer chive leaves may be draped across a fish fillet to add a spot of color to the plate. Although they do make a pretty garnish, chives add more than just a decorative spot of green. The leaves have a mild oniony flavor that doesn’t linger on the palate (and the breath) the way that raw onions will. Chives can perk up potato salad, egg salad, and poached halibut or salmon. They're also good showered over two dishes I eat often this time of year: steamed asparagus and deviled eggs. Chinese and Korean chefs use chives like a vegetable, making them a main ingredient in potstickers and dumplings, or tossing handfuls of chives into tofu and vegetable stir-fries. Chives are also an important ingredient in fines herbes, a classic herb mix of equal parts chives, chervil, parsley, and tarragon. This mixture is used in French cooking to flavor soups, sauces, and most often, eggs. Omelette aux fines herbes is a delicious classic of French cuisine: a thin rolled omelet speckled with fresh herbs. Since I grow all of the fines herbes in my garden, I can enjoy an herb omelet during the summer months, but right now, it’s only spring, so it’s all about the chives. I try to snip them frequently and use them with abandon. When I want to feature chives in more of a starring role, I make French toast or scones.